Lately, I mentioned that I have hard time finding romances that I really love. That reminded me that there's one author whose books are an exception to that: Julianne Donaldson. Her novels are clean (always much appreciated), and the relationships are teasing and tender by turns. She is a BYU alumna, just like me (woo hoo!) (Go Cougars!) Also, she has 5 kids! I have all kinds of respect for her carving out writing time with 5 kiddos to mother. That's awesome! I don't have too much more to add about her personally, except that she seems like someone I would enjoy being friends with. Unfortunately for me, she's only had 2 books and a novella published so far, but another is in the works! Yes! 4 stars: See comments, below. Kate--not Kitty--wants nothing more than to escape her shameful family and go to India with her Aunt Charlotte. However, her scheming mother is determined to see Kate married--even if she has to throw morals to the wind to do it. 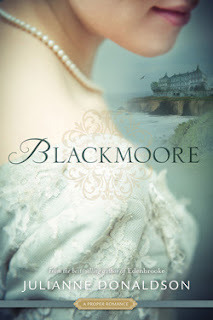 The other thing vying for Kate's desires at this point is a trip to Blackmoore, the ancestral home of her best friends, Sylvia and Henry. She has always wanted to go, but has had to stay home instead. So rather desperately, she makes a bargain with the devil--i.e., her mother--that if she refuses three proposals of marriage she can go to India. Otherwise, she must stay home and do what her mother wants, no complaining or fighting against it. That means, however, that Kate has to find 3 men who will propose to her....or does it? Perhaps she can talk someone into proposing to her 3 times in a row. That someone would be Henry, of course. If he will do it. "I stayed up way too late last night re-reading this one. The romance was sweet with glimmers of humour, and the setting was vivid. 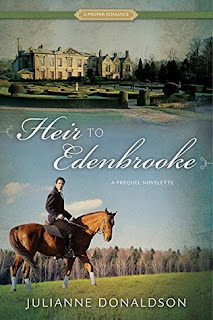 I didn't relate to Kate as well--she seems given to passionate outbursts--but it was a fun light read...again!" I actually liked it better this time around--I would raise it to 4 stars--and I don't think it's just familiarity making me sentimental. :) Kate is a passionate girl who feels completely trapped in her current circumstances--stuck, with no way out. Then she is offered a way out, and she feels she must take it, even if it will hurt someone very dear to her. Henry's care for her is so tender. I think that's what got me this time. He sees her turmoil and willingly sacrifices for her happiness. Marianne is on her way to spend the summer with some friends of the family, when she and her maid are accosted by a highwayman. They manage to get their wounded driver to the nearest inn (not very near) and while there she meets an infuriating and arrogant man. He helps more than Marianne even wants him to, after she gives him a bit of a comeuppance. When he later turns up at the estate of her friends--um, he lives there--she is mortified. Also, more than a little intrigued. He refused to say who he was, the night before, and now here he is. It doesn't help that he seems to continually catch her in embarrassing situations. However, as the days go by, she looks forward to spending time with him more than she might want to admit. They might even be...courting--if the idea wasn't so absurd. Really, they're just good friends. Really good friends. Though that may all change when her twin sister shows up. The first time I read this I kept breaking out in laughter all the way through it. I read it all in one delicious gulp and it left me with a huge smile on my face. After basking in the glow for a few minutes, what I really wanted to do was read it again! I may have skimmed over my most favorite parts a second time...which means that I basically did reread it a second time. Since then I have read it several more times. The banter between Marianne and Philip is so witty and wry, I still get a kick out of it. In case you were wondering, it is just as funny, charming, and heartwarming the fourth or fifth time around as it was the first! 4 stars: A glimpse into the life of Marianne's hero: Philip Wyndham. 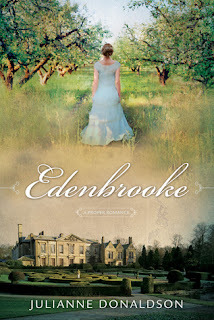 This is the Edenbrooke story from Philip's perspective. A prequel, but a very short one--it is just 53 pages long. A teaser, really, but just as delightful. I think this would be hard to pull off successfully without boring readers to tears, but Donaldson managed it beautifully. Some of our favorite scenes are retold from his POV, but we have learned enough new information about Philip that the scenes gain more depth. Having read this sort of feels like being in an exclusive club, with bragging rights (said in a condescending tone, to those suggesting some ridiculous interpretation of our favorite moment): "Well dear, we know what he was thinking in that scene." The royal We. Of course. Have you read any of these? Are you as excited as I am about her new book coming out? That's funny, I had the same feeling while reading Blackmoore. I liked it the first time but I liked it even better the second time around. And yes I'm really looking forward to her "Lost in Scotland" book! Hi Julia! Thanks for stopping by! I didn't realize she was writing another, until I looked her up for this post. So excited!